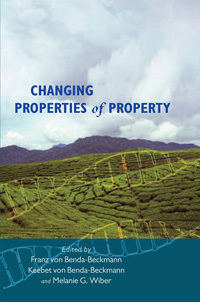 As an important contribution to debates on property theory and the role of law in creating, disputing, defining and refining property rights, this volume provides new theoretical material on property systems, as well as new empirically grounded case studies of the dynamics of property transformations. The property claimants discussed in these papers represent a diverse range of actors, including post-socialist states and their citizens, those receiving restitution for past property losses in Africa, Southeast Asia and in eastern Europe, collectives, corporate and individual actors. The volume thus provides a comprehensive anthropological analysis not only of property structures and ideologies, but also of property (and its politics) in action. Franz von Benda-Beckmann is head of the project group "Legal Pluralism" at the Max Planck Institute for Social Anthropology at Halle, Germany. He is professor for law in developing countries at Wageningen University, the Netherlands and honorary professor at the University of Leipzig. His research in Malawi and Indonesia focuses property and inheritance, social security, decentralization and legal anthropological theory. Keebet von Benda-Beckmann is head of the project group “Legal Pluralism” at the Max Planck Institute for Social Anthropology at Halle, Germany. She is a professor of Anthropology of Law at Erasmus University Rotterdam and honorary professor at the University of Leipzig. Her research focuses on disputing, decentralisation, social security, and natural resources in Indonesia and the Netherlands. Chapter 13. Property Rights, Water and Conflict in the Western U.S.
Chapter 15. Cultural Property, Repatriation and Relative Publics: Which Public? Whose Culture?